Layla has a home! 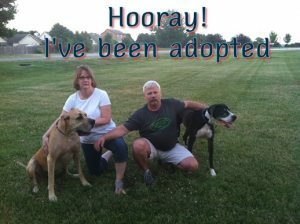 - Rocky Mountain Great Dane Rescue, Inc.
Layla has a home with Lisa and Hugh in Lawrence, KS. Sweet Layla is going to be a companion for their 9 year old Great Dane named Lady. Lisa and Hugh also have two adorable house cats named Booger and Evie…both are great with the big dogs. Layla will now get to pal around on neighborhood walks with Lisa & Hugh and Lady. They are all so excited for this lovely girl to be a part of their family. Congratulations sweet Layla!